In a remarkable 20 minute presentation on Thursday night, Elon Musk, the billionaire founder of Paypal and Tesla Motors, launched a scalable battery storage system aimed at multiple markets: from personal home use, small business to utility scale electricity storage. It is the missing jigsaw piece to the solar and renewables revolution already under way in replacing fossil fuel power generation. Elon Musk outlined the critical problem of climate change and greenhouse gas emissions from an ageing fossil fuel infrastructure, explained how it can be addressed, and launched an innovative product that could plausibly make a substantial contribution as a solution. One of the traditional arguments against a high level of renewables in our electricity grid has been the need for constant baseload power that needs to be provided by coal, gas peaking turbines, or nuclear. This argument was always false, as several reports have shown (Rocky Mountains Institute at Clean Technica, Mark Diesendorf at The Conversation, Dr David Mills at ABC Science), but nevertheless it provided a powerful, if faulty argument for maintaining our aging fossil fuel generation capacity. Our energy grid is built upon generating power constantly to meet the demand at any particular point in time. Variable sources of energy such as wind and solar have been steadily growing as a proportion of grid supply, but studies have shown that network demand has a lot of natural variability anyway. Both wind and solar generation are able to be forecast over short day-length or so periods, and thus managed as part of the normal regulation of grid demand and response. Relatively cheap energy storage will enable some fine network adjustment to power output, while aiding in decentralisation of power generation and storage. It adds a missing piece of the puzzle which aids in transitioning to a 100 per cent renewables energy system. Tesla Energy has provided an innovative solution to matching that need, and also driving down the price of battery storage systems. But it wasn’t all roses with Karl Mathiesen in the Guardian questioning Will Tesla’s home battery really transform our energy infrastructure?, highlighting that installation costs are not included and the investment payback time in the UK may be in excess of 10 years at current pricing. According to a Forbes article, cheap electrical storage could also kill nuclear power, but quite a few people think that would be a good idea, anyway. Musk’s Powerwall product is aimed at the consumer and small business market, is ready to plug in to work with existing solar panels and the grid. And it will come in multiple colours for those concerned about integrating it as part of their house or garage interior design. The 7kWh Powerwall battery will be priced at US$3000 and a 10kWh powerwall will be US$3500. The battery packs are configured to be scalable to 90kWh, so multiple batteries can be utilised if necessary. “It has all the integrated safety systems, the thermal controls, the DC to DC convertor. It is designed to work very well with solar systems right out of the box, and it addresses all the needs.” said Musk. It will also give electricity consumers a relatively easy and inexpensive option to go completely off grid. That opportunity must really scare the power utilities. Although most of their retail customers may not leave them, it will cause a minority to go off grid for a number of reasons, including economics and disaster risk management. Many people are joining the dots that the frequency and intensity of extreme weather is increasing due to climate change and solar PV plus battery storage provides a measure of disaster risk management. “Very importantly, this is going to be a great solution for people in remote parts of the world where there is no electricity wires, or where the electricity is extremely intermittent, extremely expensive. 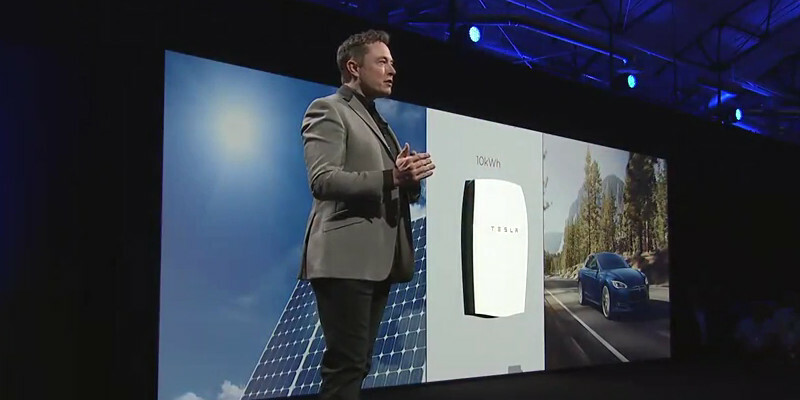 So you can take the Tesla Powerwall and scale globally.” said Musk. “What we will see is something similar to cell phones versus landlines, where the cell phones leapfrogged the landlines: there wasn’t a need to put landlines in a lot of countries in remote locations. So people in a remote village or island somewhere can take solar panels, combine it with the Tesla Powerwall and never have to worry about having electricity lines.” he explained. 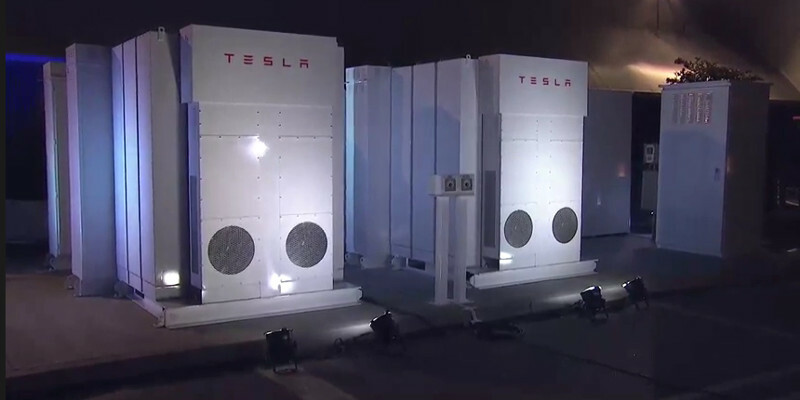 Musk outlined that a small city like Boulder could be powered – about 1 gWh capacity using about 10,000 Powerpacks. Elon Musk is a new style of innovator and entrepreneur. They are finding new business models and innovative business solutions to tackle the threat of climate change. Instead of hoarding patents like most businesses, Musk has made the various technology patents effectively open source. He understands that his company can’t make the changes alone, and thus has opened up the research and innovation his company has done to stimulate competitors work and to grow the industry more rapidly. “We think many other companies need to build Gigafactory class operations of their own. We hope they do. The Tesla policy of open sourcing of patents will continue for the Gigafactory, for the powerpack and all these other things.” Musk said to loud cheers from the audience. Musk pointed to a chart of the Keeling curve showing the projected CO2 trend stretching up to 1000ppm by the end of the century, but also a trend of CO2 levelling out at 450ppm if we take rapid action in transitioning to renewable energy and reducing carbon emissions. “The path that I have talked about: the solar panels and the batteries. It is the only path that I know that can do this. This is something we must do, we can do and will do.” said Musk. Funnily enough traditional power utilities are also looking at the battery storage market. In the US and Europe Sonnenbatterie has teamed up with Danny Kennedy’s Sungevity to offer battery storage system to add to solar PV systems in the second half of 2015. In Australia AGL Energy came out with an announcement for home energy storage option with 6kWh battery, although they haven’t announced any pricing details. AGL Energy has substantial interests in coal fired generation and fracking in Australia resulting in the company being the largest single carbon pollter in Australia, according to a recent Australian Conservation Foundation investigative report. While orders for the Powerwall and Powerpack are being taken now, production will start slow in the Fremont factory with initial deliveries expected in a few months. In 2016 production will ramp up when the ‘Gigafactory’ is completed in Nevada. Tesla Energy signed a contract with the Nevada Government to build the massive ‘Gigafactory‘ to produce battery products for the Tesla Motors electric vehicles and now the Powerwall and Powerpack products. It will enable the driving down of costs for mass market electric vehicles. The factory will be entirely energy self-sufficient by a combination of rooftop solar PV, nearby windfarm and geothermal power. It is expected to start production in 2016 and reach full capacity by 2020. The Tesla announcement is the latest in the solar revolution quietly under way. Watch this youtube video of the growth in solar PV installations from March 2007 (13MW) to March 2015 (4169MW). 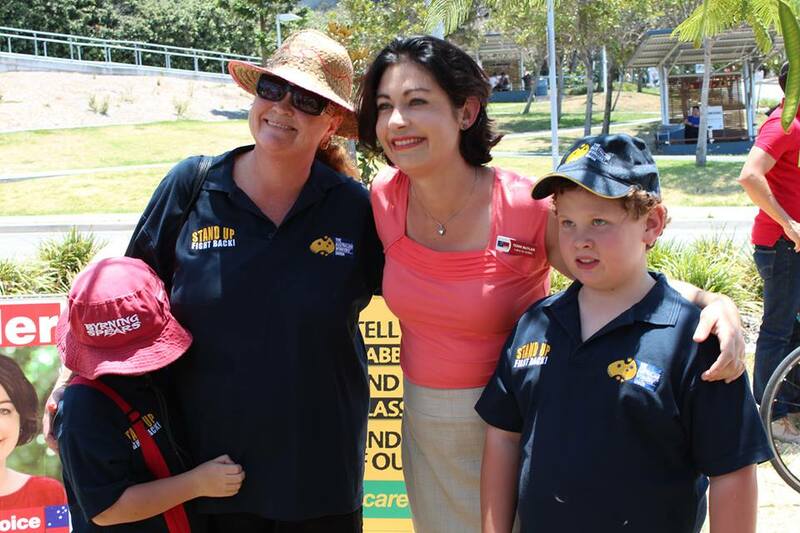 As of March, 2015, 27.4 per cent of Queensland households have solar PV, 20.5 per cent for Western Australia, 27.8 per cent South Australia, 13.1 per cent NSW, 12.9 per cent Victoria, 12.5 per cent ACT, 11.5 per cent Tasmania, and 7.1 per cent Northern Territory. Australia is a world leader when it comes to the rollout of residential solar PV. Nigel Morris highlighted the power utility death spiral issue, “One thing we can see is change is inevitable.” What the death spiral highlights is “it is absolutely essential that utility companies either evolve or perish. They have no choice, the market is changing around them and they cannot continue to operate their businesses and do things the same way they have done them for the last 50 years.” he said. “They can block and they hold enormous power to slow things down and they can control things…but what is absolutely inevitable is that the consumers want more control over energy costs, they will increasingly affordably generate their own energy and take control of their own costs by generating energy from solar…Competition is already driving this.” said Morris. He predicted that by 2018 Australia could be generating 10GW from solar PV, greater than 20 per cent of the energy required in the national market, with 64GW of untapped commercial rooftop potential. Right towards the end of the video in response to a question, Morris articulated a recent proposal to install huge Gigawatt sized solar farms up around north western Australia and to use the Ord River Dam system as pumped storage. Then Australia should install a high power undersea transmission cable to Indonesia, Singapore and beyond to sell this power to our northern neighbours, who still have rapid energy demand growth. The export of solar powered electrons would replace coal. “It seems so intuitively logical and sensible to me” said Morris. In the United States there has been more solar capacity added by utilities in the form of concentrated solar thermal and solar PV farms to date, but residential rooftop rollout is picking up pace. Transitioning to a renewable energy electrical grid will have enormous health benefits across the US, as polluting power stations and coal mines are phased out and closed down. 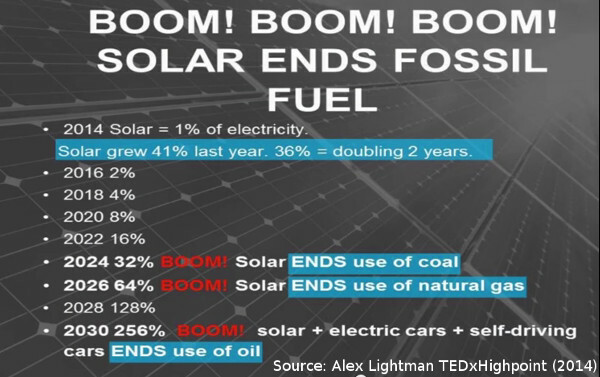 Futurist and engineer Alex Lightman (Wikipedia bio) outlines in a TEDx Highpoint talk how the solar revolution could completely eliminate use of fossil fuels by 2030. Just 15 years. Does that sound impossible to you? “This is not a fantasy, this is an inevitability” says Alex Lightman. 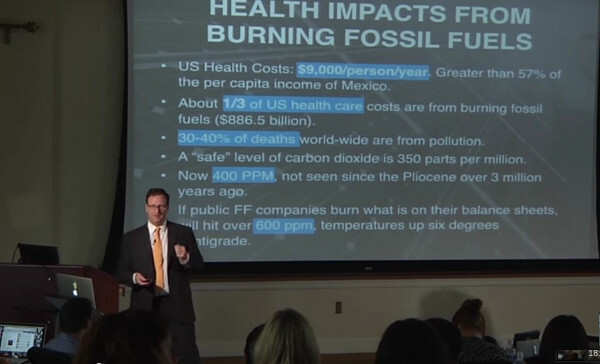 Lightman explains the health impacts of coal and fossil fuels, the climate impacts from burning fossil fuels and the rising costs for adaptation if we do not rapidly escalate mitigation efforts. On one slide he identifies that Natural gas extraction uses 4.5 trillion gallons of water, an enormous amount that could be better used as potable drinking water and agriculture. California and the south-west is already under mandatory water conservation measures due to a 4 year long drought. 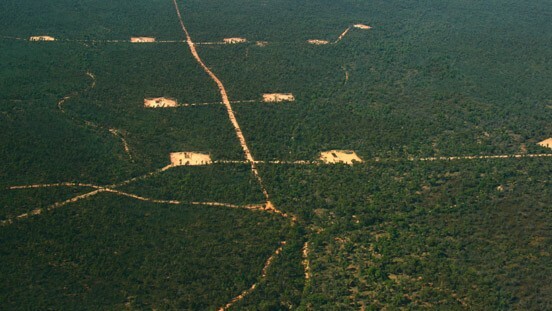 Natural gas mining also results in numerous ‘fraccidents’ where water aquifers, and water systems are contaminated. Lightman explains that by 2030 solar could provide enough energy to power the grid as well as electric cars and trucks. For legacy vehicles he proposes that they be converted to run on ammonia, NH3. Cars would only require minor alterations to run on clean ammonia, which would produce zero carbon emissions. In his 8-fold path to ending fossil fuels he argues that for number one we should stop subsidizing and protecting fossil fuels (to the tune of $2 trillion per year globally), ten times as much as the money being spent on renewables. He also advocates an ETS and carbon tax implementation, and regulations to make companies clean up their mess and pay for all their carbon pollution health and social costs. Lightman didn’t mention battery technology, but that will serve to increase adoption and uptake of the solar revolution. 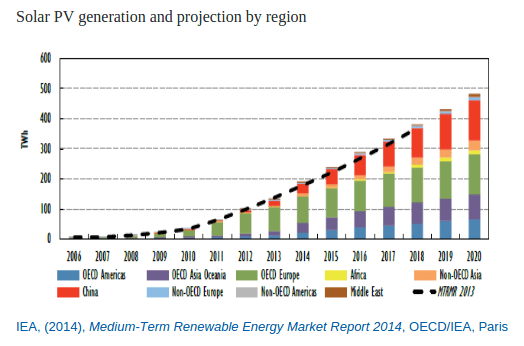 As of the end of 2014 The Global Solar PV Market Hit 177GW in 2014, A Tenfold Increase From 2008 according to a March, 2015 Greentechmedia article. The transition is happening and the solar revolution is one of the main drivers. As Paul Gilding, Australian sustainability business consultant and former CEO of Greenpeace, explains in his February 2015 article The year the dam of denial breaks – ready for the flood?, everything is changing. He outlines 6 drivers of system change: the US-China climate deal; collapse in oil prices; continuing fall in solar prices; market prices reflecting economic disruption; political power of big business shifting sides; physical impacts accelerating driving economic and security shifts. Gilding reflects that the Paris climate talks in December are more likely to be an indicator of a transitional shift than a major driver. A climate agreement from the Paris COP21 would reflect the deep changes already happening globally, with or without Australia’s assistance. While Australia is seen as important influencer in the Asia-Pacific region, our current policies will be seen as an aberration and ignored if we don’t undertake the transition ourselves. 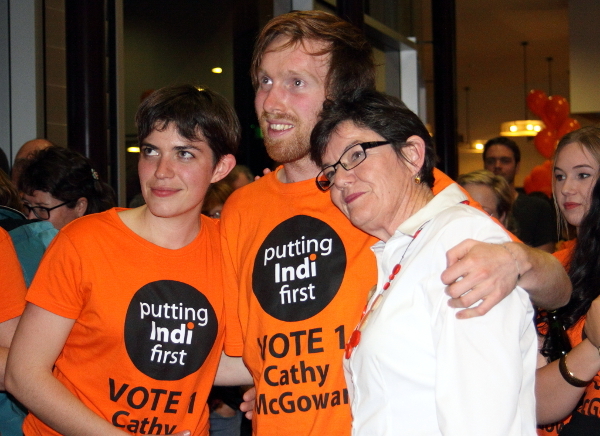 The Australian people have already voted with their money – an estimated $8 billion invested by 1.4 million households in rooftop solar. It is our governments that are blocking transition through policies and massive subsidies favouring mining extraction and fossil fuel generation while holding back investment in large scale renewables through threatened cuts by the Warburton Review of the Renewable Energy Target. John Englart (@takvera) and his teenage daughter Tarryn Clancy (@climateteen) will be travelling to Paris to report on the United Nations COP21 climate talks (including for Australian citizen journalist site Nofibs), and in particular what role Australia plays in those negotiations. Over $1400 was successfully raised from 20 backers through crowdfunding to help meet their living costs while covering the climate talks. And yet the Commonwealth Government wants us to pretend there is no need for sustainable energy (or climate change of course). “Coal is good for humanity!” This government, while claiming to support jobs creation would be happy to see no renewable energy industry in this country – WHEN WE USED TO WORLD LEADERS IN SOLAR POWER. This country is pathetic – when what we desperately need is to be smart.